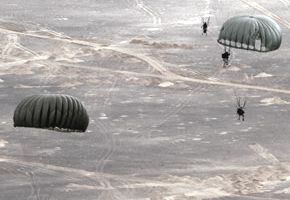 In the Air Force, Special Operations Combat Medics and Rescue Specialists are trained and equipped to conduct conventional and unconventional rescue operations. Known as PJs, these airmen rescue downed pilots, conduct combat search and rescue operations, and assist Navy SEAL platoons and Army Special Forces units as combat medics. PJs may conduct their duties in humanitarian and combat environments using air, land, or sea tactics. The training for these airmen is among the most rigorous and intense of any in the U.S. Armed Forces. As part of the Air Force Special Operations Command, candidates have to be of above average physical abilities. Being a good swimmer and competent in the water is critical to making it through training, since saving personnel in the water is a requirement of the job. Running, lifting, and high repetition calisthenics also are required to get through the physical challenges of the training program. And PJs also take challenging courses in medical training. The Physical Ability and Stamina Test (PAST) is for recruits seeking Pararescue status. In the Air Force, the special ground combat units are known as Battlefield Airmen. After Basic Military Training, all members of the group will attend a Battlefield Airmen Prep Course for eight weeks. The following chart demonstrates the PAST requirements for each of the Air Force Special Operators. This test must be conducted in a three-hour time frame and in the order listed below. There is one pass/fail event and five point-scored events. The candidate must receive a combined total of 270 points, and pass the pass/fail event in order to receive a passing grade on the PAST. The below chart includes the requirements for each of the Air Force's Special Operations segments: Pararescue (PJ), Combat Controllers (CCT), Tactical Air Control Party (TACP), Survival, Evasion, Resistance, Escape (SERE) Instructor, Special Operations Weather Tech (SOWT), and Explosive Ordnance Disposal (EOD). Training to just meet the minimum standards for the PAST is not recommended as the training itself is highly competitive to join. Plus, once in the selection and training program, students will be pushed both physically and mentally. Being in good physical shape and having a foundation of fitness will serve students well in the challenging 18-month training pipeline. To get accepted into the Air Force PJ program, you have to first focus your training routines on the events listed above: Swim, Run, Pullups, Pushups, and Situps. Consider this your entrance exam. You'll need to be a fast runner and strong swimmer, and be able to do higher repetitions of calisthenics than the average military person. Otherwise, your chances of getting accepted into the program may be limited. Most people who succeed in these challenging fitness tests and follow on selection programs will run and swim five or six days per week to improve their time. Also, the upper body calisthenics requires training at least three days a week (every other day) at a high volume. Getting through the training will build upon the above fitness foundation focusing on more strength, longer distance endurance (longer swims with fins, longer runs, long rucks) and skills in the pool such as treading, drown-proofing, buddy breathing, and other pool and SCUBA diving competency tests.